Veronica’s snacks newest team member – sarah hassell! Hi there – let me introduce myself, as I am not Veronica. I’m Sarah Hassell, and I’ve just come on board the team. I was a regular working mum until I was let go in November 2010. I took some time before i went about looking for a new job, as I thought I’d spend a bit of time with my two girls (Alice and Eleanor, now 5 and 3) before finding a new job…. How wrong was I! Little had I realized at the time how hard the recession had hit and how difficult it would be for someone who isn’t a doctor or a dentist or an accountant – just a sort of a customer service / support / fixer / all-rounder type to get a job in the new era of austerity. Then one day, a couple of weeks ago, I received a phone call in the middle of the afternoon from my sister-in-law, Helen. She lives in Cork and is a good friend of Veronica – I’ve heard the name mentioned over the years, but that’s all. 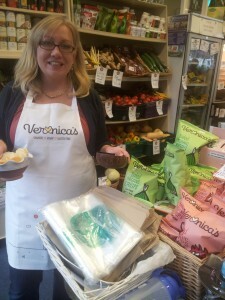 Anyhow, she mentioned that Veronica had set up this business (Veronica’s Snacks) producing fantastically tasty, organic, baked, low fat, gluten free crisps and that she was looking for someone to look after her customers in Dublin, show them a little TLC and maybe even run a few tasting sessions. I thought, “that sounds exactly like my cuppa, count me in! Something I could work round school and playschool drop offs and pick ups and yet allow me to get the “little grey cells” working again (as Hercule Piorot might have said). Two weeks later, I’m spending my Saturday in a gorgeous organic food store / juice bar / cafe known as the fantastic Select Stores Dalkey in a Veronica’s Snacks apron, approaching the unassuming customers and getting them to taste the wonderful, taste-tastic, organic, gluten free, 60% lower fat, so good for you that you can polish your halo as you munch Veronica’s Snacks! Here I am.. So, watch this space for more updates from us at Veronica’s about future tastings – catch us next Saturday at Blackrock market, at the Organic Supermarket stall.